Stuart Turner could soon be looking round the Grand Canyon or Niagra Falls using the 2kg flying device, which he controls by moving his head his head and eyes using Google Glass computer worn on his head. The 36-year-old has lost the use of his arms and legs over the past 10 years, due to spine and brain disorders including spina bifida, tethered spinal cord syndrome and chiari malformation. Mr Turner, who was forced to drop out of a degree in computer science, has been developing the drone, and the software to control it, with scientists at Brown University, Rhode Island. He uses a Parrot AR Drone which has four separate rotary blades with a camera mounted on its body. The device is still in testing phase, meaning that Mr Turner has so far only flown it around campus. He hopes to develop it further by replacing Google Glass with a type of virtual reality headset that will give him a three-dimensional, panoramic view of the drone’s location. Mr Turner also uses so-called telepresence robots, remote controlled land-fairing robots, to look around far-flung museums such as the Melbourne Museum in Australia, whose staff allowed him to pilot the robot through its halls after-hours. The robotics expert said: “Drones open up doors that would otherwise be there, helping to expand my world from my house to anywhere in the world with Wi-Fi. “I’m hoping to be able to fly faster, further, higher with a greater degree of control. 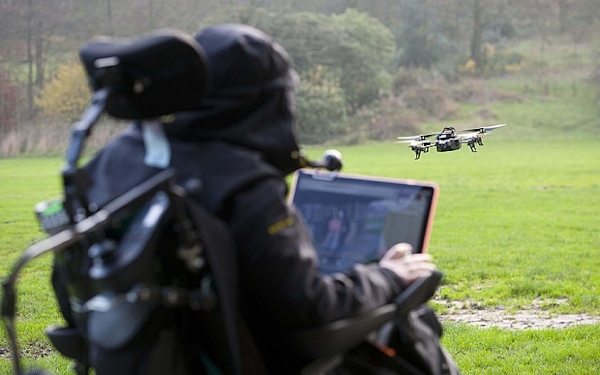 “I also – and this is probably the main aim – want to experience first-person flight, which will truly liberate me from this wheelchair in a way that isn’t really possible at the moment. “I would be flying without leaving my wheelchair. There’s no way I could travel at high speed 20 metres into the air without a drone. Mr Turner, who tests software for Apple and tests security systems for large companies by hacking into them, added that he hoped that his drone could show how the much-maligned robots could be a force for good. He said: “For every killer drone you show me, I can show you a drone that is saving lives all around the world. “If I can help change the public view on drones, that would be great and I’d be happy to do it.